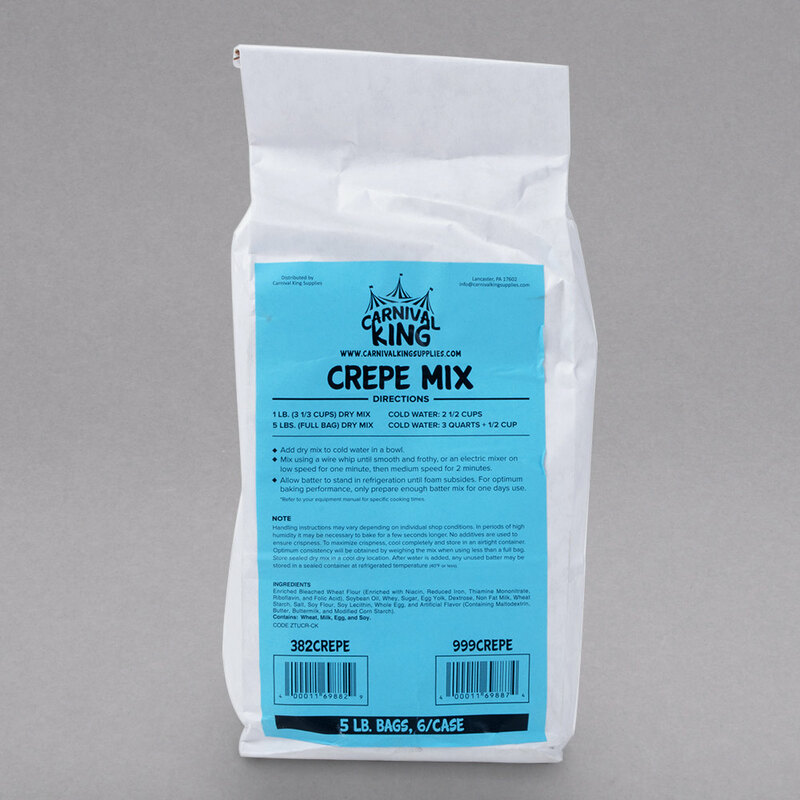 Treat your patrons to the rich taste of traditional French crepes made from this convenient, simple-to-use Carnival King crepe mix! Featuring a pancake-like consistency, yet lighter and thinner, crepes are flexible to fold around your sweet or savory fillings. Crepes are versatile enough to accommodate all of your patrons' preferences. For a sweeter taste, serve crepes filled with your favorite fruit fillings and topped with powdered sugar or a dollop of whipped cream. Whether served as a sweet dessert, snack, or satisfying meal, the delicate texture of crepes can be filled with a variety of wholesome ingredients, including breakfast meats, savory cheeses, onion, and more! Upgrade your carnival stand's dessert recipes or your cafe's gourmet-style lunch offerings, and serve an essential French treat. With its bulk size, this crepe mix will keep your operation in great supply. If you're unsure how to make crepes, this Carnival King mix produces a consistent crepe batter that's not too thick and not too fragile, yet thin enough to roll and fold your crepes whichever way you'd like. Choose a variety of delicious crepe fillings to expand your menu! To prepare, add dry crepe mix to cold water, and mix until smooth and frothy. For every 1 lb. of dry mix, use 2 1/2 cups cold water. For every 5 lb. full bag of dry mix, use 3 quarts plus a 1/2 cup of water. Allow the batter to stand in refrigeration until the foam subsides.